The beauty of smart locks is no longer having to use your house keys, but most people still carry them because they’re afraid their lock won’t work. Well what if we told you that there’s a smart lock out there that’s so reliable, it doesn’t even give you the option of using a key because it doesn’t have a keyhole at all. 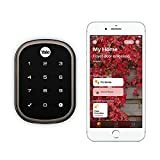 The Yale Assure Lock SL with iM1 features HomeKit support so it works with any iPhone. It also features a touchscreen keypad so you can give permanent or temporary PIN codes to your friends, family, or house sitters while you’re away. You’ll be able to see a log of everyone who goes in and out of your house, and you can even configure it so that you’re notified when specific people unlock the door.